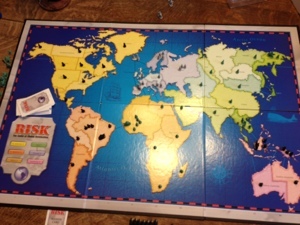 So I think Im okay at Risk, the board game. Now, I’m not sure that Risk has really taught me anything I didn’t already know, but it has given me the opportunity to exercise some of my less developed communication and strategic skills. So Risk is basically a push-your-luck style game masquerading as a strategy game. The game does require one to pace oneself or usually end up dead (best case scenario after overextending is a stalemate). I enjoy playing computerized versions of the game and I do fairly well at them. However I much prefer to play with live people in front of me. Preferably with them playing as well. This adds a whole new layer of depth to an otherwise simple game of probabilities and risk taking. With other players, Risk can even become a co-operative experience (but only at times, as there is only one winner). Treaties are almost necessary to win the game. One player against 2-5 others is almost impossible. It’s to the benefit of both players to form an informal alliance as it allows them to either focus their forces elsewhere or against a common enemy. The problem comes with a fact I just mentioned, there is only one winner. It’s hard to keep a treaty when your “friend” is stabbing you in the back covertly. The fact that everyone is still technically against you makes diplomacy hard at the best of times. This problem is magnified by the fact that even if you are a great diplomat you can still lose the game if you’re not a good strategist. But I’m not here to talk about Risk strategy, I’m here to talk about diplomacy. It’s really important in Risk to keep your opponents off your back. The best way to do this is obviously through a temporary alliance. This will work for the first couple games. But if you’re like me and you either win all the games or are at least a very strong opponent at all times, people will be hesitant on this front. Diplomatic skills are necessary to stay alive as everyone tries to kill you because they are bitter about losing the last game (which they have a right to be). In this situation, the ability to keep talking and playing up the strengths of other players while drawing attention away from your own is a great skill to have and develop. The player that messes up and says something that may break or make tense an alliance already held will likely end up losing. A losing player is also quick to make an alliance, especially with a very strong player. Knowing when to talk, what to talk about, and who to talk to is a great skill that can be developed and honed in Risk. Learning to strategically begin peace talks and/or negotiate for a place is a very handy skill to have. Risk is a great place to learn it. Other games have rules against negotiation or complicated rules that could cripple the negotiating process. Risk is a blank canvas on which one can put almost any type of diplomacy. From threats to counter-attack, to agreements to not attack on a certain front, to a pincer movement on a common enemy. Very few games offer the sandbox that Risk does, as other abstracted games of strategy have few player and no room to negotiate (chess, checkers, Stratego, etc.). 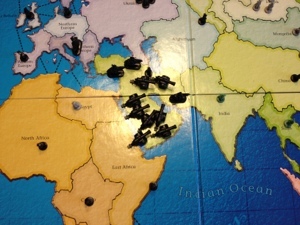 Risk is one of those games that is much better with people face to face. You can bluff like in poker, you can bolster like in three card brag, you can threaten like in chess, you can fortify like Startego, you can be tactical like in checkers, and you can negotiate like in diplomacy. It’s great, there are enough ways to play that everyone you know can. Each time I play I feel like I learned something new about the people I played with. Risk can be a great tool for teaching compromise, strategy, and negotiation. And of course other things, but I believe it shines best as a version of diplomacy with luck. If you didn’t like if before because you thought it was slow, give it a try with a group of deal makers and I think you’ll have a much better time. I gotta play a game now.